The CoffeeShop Blog: Lightroom Tutorial: Paint With Light! Lightroom Tutorial: Paint With Light! Sometimes all you need to do to make a beautiful image stunning is selectively add some light and contrast. Those of you that are old school will call it dodge and burn (yes, I had a closet darkroom in my 20's). I am creating a really nice Photoshop/PSE action for this type of edit called Paint With Light (I hope to have it out in a few days) , but I wanted to post a tutorial for my Lightroom users. In this case I did not write a preset for the edit. Since this type of editing involves selectively adding enhancement layer brushes to different parts of the image, I find it easier to use adjustment brushes with custom settings for each image. 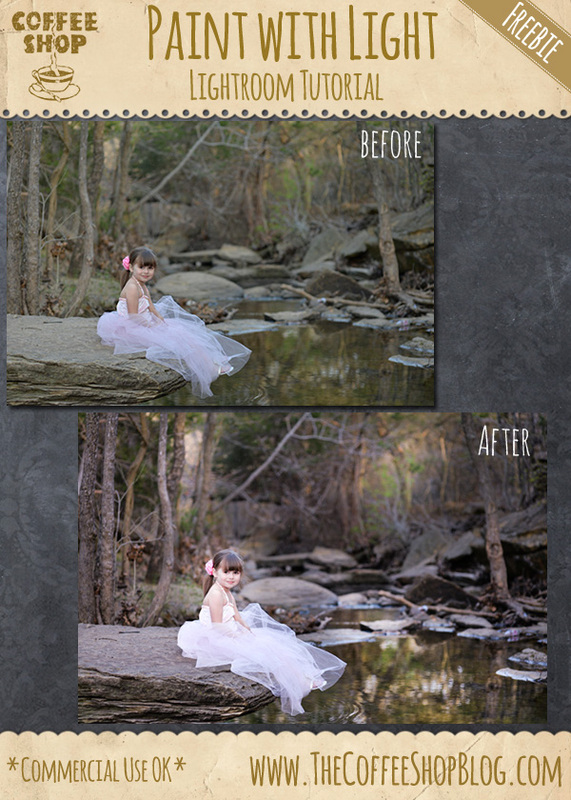 This is such a quick and easy edit in Lightroom if you have used the Adjustment Brush (K) before. 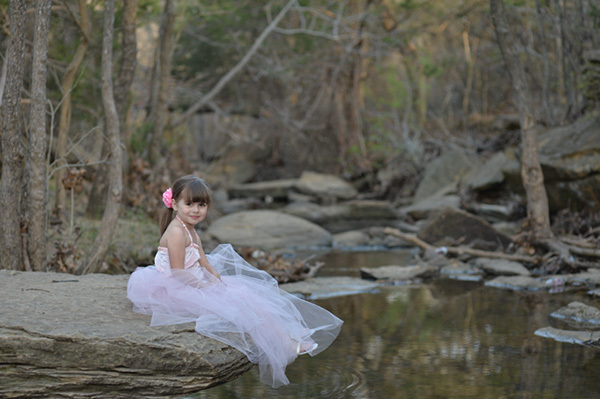 I am going to walk you through how I edited this beautiful SOOC image from Julie Peveto Photography (Facebook) for this tutorial. This tutorial has screenshots from LR4. I ended up adding four different adjustment brush layers. Adjustment brush layers are similar to layers in Photoshop. You can edit each one individually, and they are layered over your image. So you can go back and make adjustments to each "layer" at any time. This entire edit just takes a few minutes. This is the SOOC image. It is beautiful but needs a bit of contrast/light. I want to use adjustment brushes so I can add it selectively. Dodge (Add Light): I clicked "K" to get my adjustment brush and raised the Exposure to 0.90, Contrast to 20, and Highlights to 20 and unchecked Auto Mask and had feather at 100%. Don't worry about the settings, you can adjust them after you paint on the image. You can use my settings for your starting point. 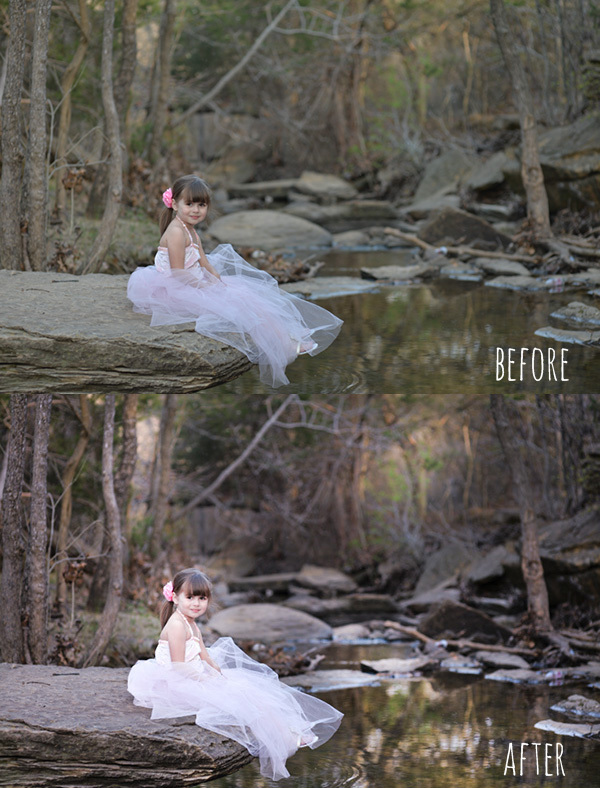 I painted over areas of the trees that had some light going through them, on the little girl's face and dress, and over the water to enhance the sparkle and reflection. To see where you have painted, hold your mouse over the little circle mark on the image and it will turn red. You can see that I have four little dots on this image because I added four different adjustment brushes. Once you are satisfied with the adjustment click on Close. To edit this layer brush later, select the adjustment brush (K), and click on the little circle where you added the first stroke. It will turn black and the settings will be displayed in the adjustment brush pane. Burn (Add contrast and shadows): Open a new adjustment brush layer (K) (make sure "new" is checked). I made the Exposure 0.40, Contrast 50, Shadows -50, and Clarity 30 and kept Auto Mask unchecked. These settings can be adjusted to taste for your image. I painted over areas (red) I wanted to add contrast and shadow. Once you brush the adjustment layer on you can then go and adjust the settings to taste. Then press Close. If you want to go back to change the light or contrast adjustments, click on the adjustment brush and then click on the little circle mark on the image. Add Tint: I wanted to add some drama to the light, so I added a pinkish tint (the original image was a little too green). I grabbed a new adjustment brush (K), and made Tint 40, Exposure -0.40, Contrast 20, Highlights 25, and Shadows -10. Play with these settings for your own images. I then painted over the entire image. Brighten the Face: Finally, I wanted to add some additional brightness to her face, so I added one final adjustment brush and made the Exposure 0.30 and added it around and on her face. Here is my final edit. I think everything really "pops" now, but the colors and edit is still quite clean and not too manipulated. I love the sparkle in the water and the subtle light in the trees in the background. I do think her dress is a bit blown out, so I could go back to the first adjustment brush where I added the light and erase the brush layer off parts of her dress. The adjustment brush layers have an option to select an Erase brush so you can remove your brushstrokes. I love how Lightroom allows me to edit nondestructively so easily. If you don't have Lightroom 5 you should go check it out. I am still peeved at Adobe for making people rent Photoshop now instead of purchasing the program outright (I still use CS4), but if you want to avoid paying a monthly fee and be able to use Photoshop actions and Lightroom, you can purchase the Adobe Photoshop Elements 12 and Lightroom 5 Bundle and save over 20%. If you are not planning on writing your own actions, PSE and LR would be an editing combo powerful enough for even a professional photographer. I use Once Upon a Time without the vignette and Sun Kissed without the lens flare as my quick go to actions. I love this example. Thank you so much! Awesome! Thank you so much for posting this!